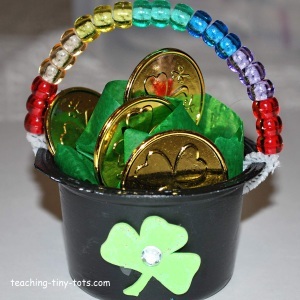 Toddler Activities: Ponybead Rainbow and A Pot of Gold! Paint outside and top rim of yogurt cup black. Let dry. Adult used tip of scissors to make a small hole on either side near the top. Have child string beads on pipecleaner. When cup is dry decorate outside with stickers, foam shamrocks or rhinestones if desired. Stuff with tissue and coins or candy. Spray painted yogurt cup with silicone sealer if you want it to be shiny before decorating or adding the rainbow. The leprechaun is Ireland's national fairy. He stands less than 3 feet tall, is dressed all in green, and wears a pointy, feathered cap atop his head. Legend states that if you are lucky enough to find a leprechaun, you must be careful not to let him out of your sight until he tells you where the pot of gold is. You had better be on your toes, though, because leprechauns are known to be cunning and quick. In the blink of an eye, he will disappear taking your hopes for good fortune with him.